It was becoming clear that neither of our main blog writers was interested in this set so someone had to do a post for it. I kind of like the issue and understand the reasons behind it too. I can see the idea of getting people, particularly children, out into the garden growing things. In this case, vegetables that are easy to grow but will make a healthy choice to many meals. I can also see NZ Post, a company facing declining sales due to fierce competition from the internet, looking for ways they can generate interest in their products. So I took up this issue and ran with it. 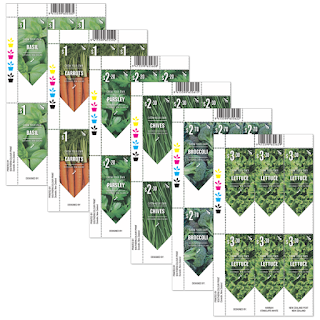 The Grow Your Own stamp issue is all about growing your own herbs and vegetables. 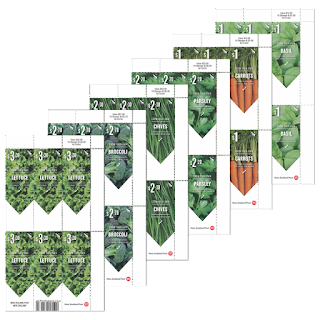 To help you along the way seeds are included for three vegetables and three herbs. The idea is that people will raise these seeds until they can be transplanted to either a larger pot or outside to the garden. 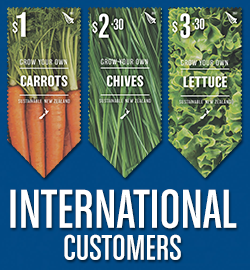 The problem with this idea is that many countries will not allow seeds to be imported. Rather than trying to work this out, with each country having different laws and restrictions, NZ Post thought it better to put a total ban on all overseas sales. Domestic Customers can buy either the seed or the non-seed version but International Customers must buy the non-seed version. I'm very impressed with this idea. 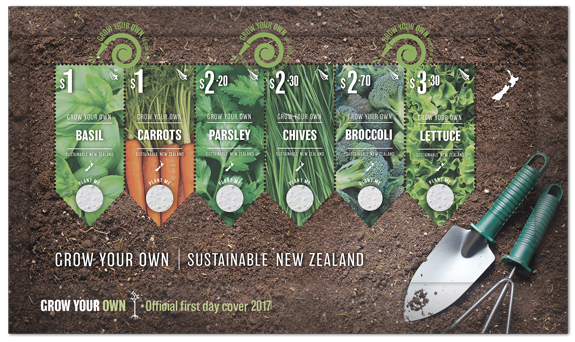 First, NZ Post has found an interesting way of marketing their product and secondly, they have found a way to help some people move to more healthy food. 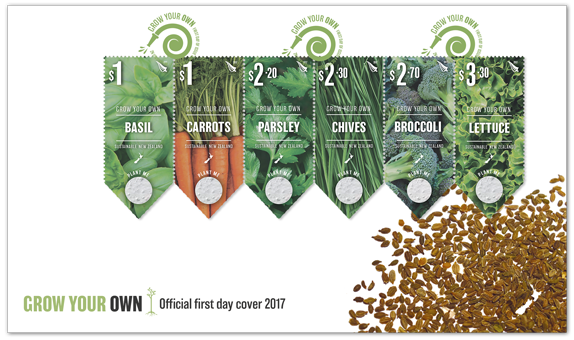 I know a similar idea was once used in a Health Stamp Issue (2014) but here the seeds have been added as well. In Thailand, I never had the chance to grow anything because I lived in a larger town. When I was living in a flat in Auckland while I was studying, my flatmate had some pot plants. I got two as well, one of which I still have. Then when I moved to a dairy farm there were fruit trees and a large vegetable garden. Now, at the place I am living now I have established my own vegetable garden. There is something special about planting a seed and watching for the first shoot to appear. Tending and watering the tiny plants as they grow and mature. There is also something satisfying looking at a plate of food in front of you and saying, "All those vegetables came from my own garden. I grew them!" The stamps were shown on the NZ Post website on their own and in small sheets of ten. I've decided to place both of these together for each value as we move down the page. I also like the way the captions/descriptions personalised each herb or vegetable so I've taken that for this page as well. Of course, below that you will find the usual collectable items too. 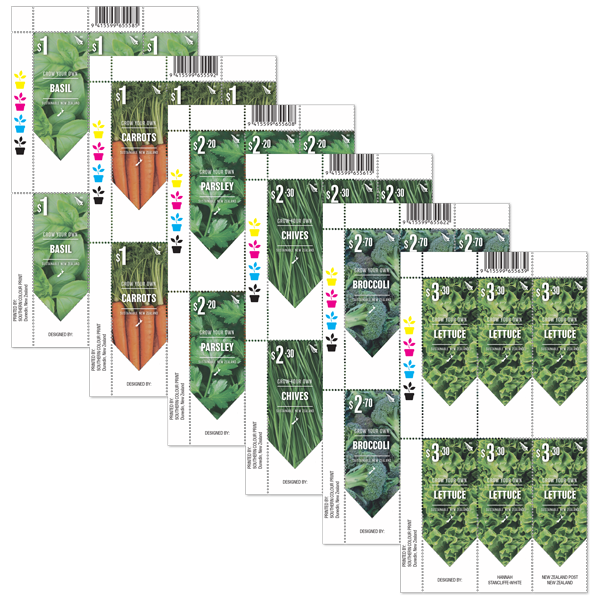 $1.00 - Basil Sheet of 10. 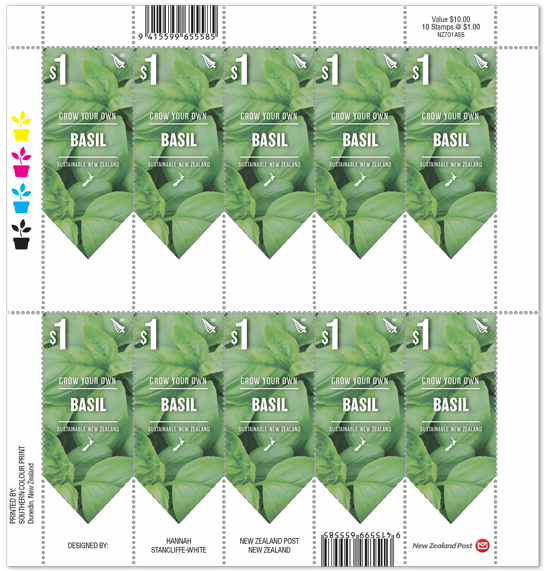 $1.00 - Basil Single Stamp. I’m a star of the summer herb garden and a must-grow for Italian and Mediterranean cuisines. I’m often found with my close friend’s tomato, olive oil, garlic and lemon, but actually, I get on with all sorts. Try me with strawberries! I love heat, and if it’s too cold I’ll sulk or even turn up my toes, so give me a sunny spot in the garden and don’t shift me outside until late October at the earliest. $1.00 - Carrots Sheet of 10. 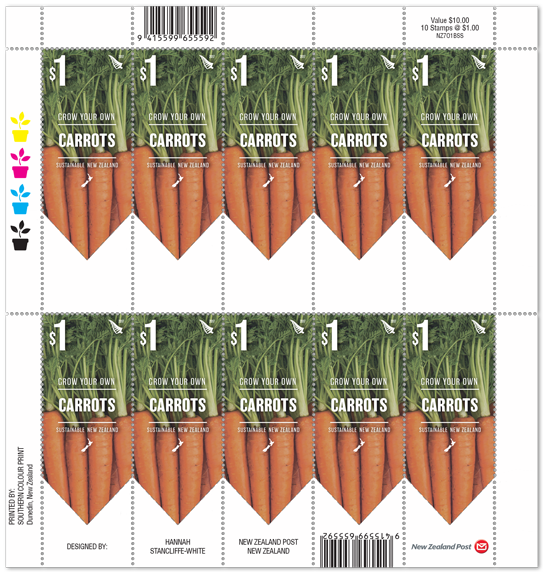 $1.00 - Carrots Single Stamp. I’m not one to push forward – in fact, I spend a lot of time under the soil. But once dug up, I’m a team player, fitting in with working class crops like spuds, peas and parsnips, but I also mix well with toffs such as ginger, dill and thyme too. I even have a sweet side... try me roasted with honey or in a cake. All I ask in return is a sunny spot and loose, crumbly soil with no lumps or stones so I can stretch out. $2.20 - Parsley Sheet of 10. 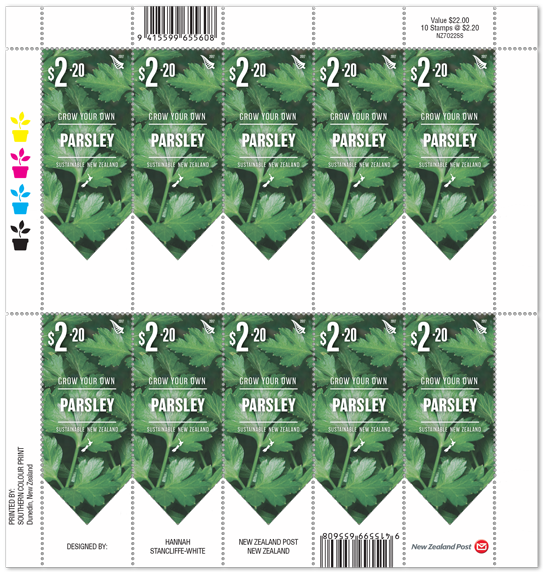 $2.20 - Parsley Single Stamp. I’m not one to rush – it takes three or four weeks for me to germinate – and perhaps that’s why I’ve been neglected by trendy foodies. But I deserve so much more than life as a garnish. I can star in tabbouleh or pesto, and I’m also happy supporting delicate tarragon, chives and chervil. I’m also superb at toning down strongly flavoured sage or rosemary. Try me in the ornamental garden as an edging plant in a border, or mixed with flowering annuals in a pot. 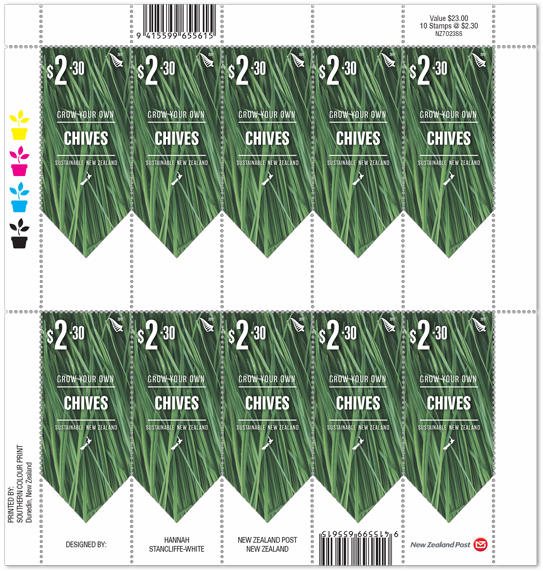 $2.30 - Chives Sheet of 10. $2.30 - Chives Single Stamp. I’m a member of the onion family, but I’m much more delicate, in flavour and in texture than my bulbous cousin. My mild nature means I get on well with almost all other herbs, and my hollow leaves can be snipped onto soups, sandwiches, salads and spuds. Plus, I have a particular penchant for anything made from eggs. My purple or pink pom-pom shaped flowers are beloved by bees, and edible too! Toss them over a salad for a pretty garnish. $2.70 - Broccoli Sheet of 10. 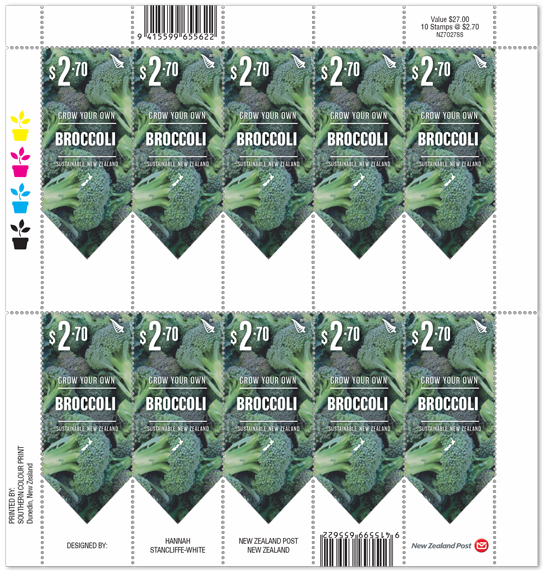 $2.70 - Broccoli Single Stamp. I might be found in the vege patch, but in my heart, I long to grow in the flower beds, my tight, green, edible florets are actually my unopened flower buds. If you leave me alone, each one opens into a bright, yellow bloom, but be sure to pick me before that happens – as soon as flowers form, I become tough and tasteless. Once you’ve cut off my head, leave my roots in the ground and smaller broccolini-sized shoots will form on my stalk. 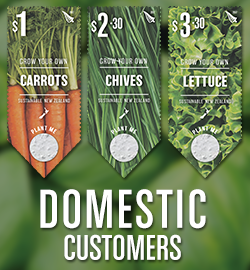 $3.30 - Lettuce Sheet of 10. 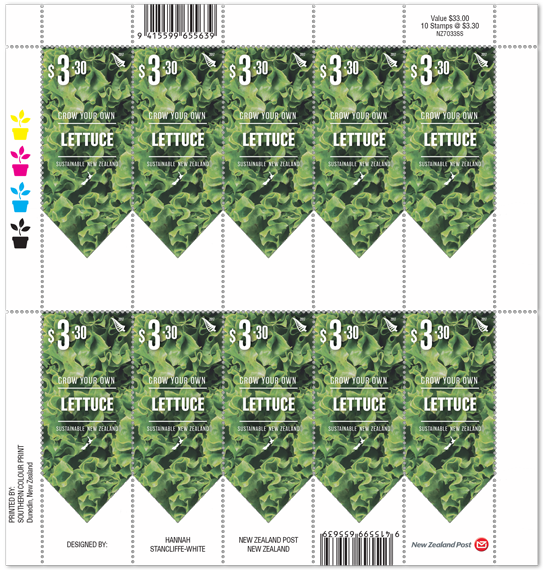 $3.30 - Lettuce Single Stamp. I’m an easy going, fast-growing leaf crop and a must-grow for summer salads. However, I actually appreciate a bit of shade in the middle of summer, as if I overheat or dry out I quickly become bitter tasting or bolt to seed. People talk about ‘salad days’.... well, I’m here for a good time, not a long time, and plan to live fast and die young. The quicker I grow, the crisper and sweeter I taste. Planning is key when it comes to planting your vegetable or herb garden. Choosing the right location and knowing in advance how much space each plant will need will reduce the risk of having an overcrowded vege patch. First Day Cover - 4 October 2017. Transferring your herbs can be it of a tricky business, but if you live in a temperate climate then it is worth it. Make sure your seedlings reach the right size before you move them, water them frequently following replanting and make sure that the soil is appropriate and accommodating for young seedlings. Miniature Sheet First Day Cover - 4 October 2017. For a successful crop, regardless of the type of plant, you must have a nutritious base to start. Make sure that your soil is free of any rocks or obstacles and that you’re using a fertiliser suitable for your plants. In this case, the blocks above are more half sheets than corner blocks. 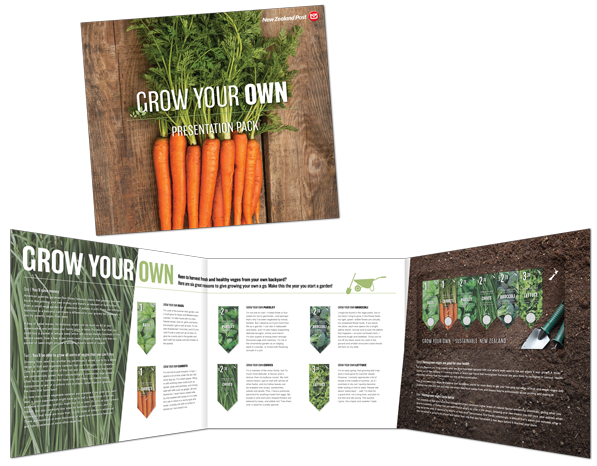 If you’re still not convinced that growing your own herbs and veges is for you, then you definitely need to check out this fun and educational presentation pack. Read about why growing your own is good for your health, wellbeing and wallet. Find out more about each individual plant with cute descriptions as told by the plants themselves. Unless stocks are exhausted earlier, these stamps will remain on sale until 3 October 2018. First day covers will remain on sale until 3 December 2017. I like the way you used your own words in your interduction to this post. Further down you took the rather amusing captions from NZ Post where each herd or vegetables were personalized. A blend of you words and those of the website. This works well Kim. Like you, I believe in the pure, healthiness of fruit and vegetables taken directly from the land. My son, who lives in the house next to mine, keeps a large garden behind my house. I help where I can but bending to tend small plants has become too much for this old lady. The best part of this post was your words - There is also something satisfying looking at a plate of food in front of you and saying, "All those vegetables came from my own garden. I grew them!" I agree with that, Kim.